Please note: there are now six wind farms which affect Straiton and the surrounding area. The Hadyard Hill Extension consists of 31 turbines at a maximum 126.5m high. There are already 52 turbines in this wind farm. Our composite map below is now out of date and there are some new Planning documents which we will upload in the near future. Wind farms are now planned almost all around Straiton. Linfairn (about 4km from village, reduced from 25 to 17 turbines as of December 2014, located up the Girvan valley on Knockcronal, Big Benyaw and Genoch Inner Hill. Tip height of turbines 126.5m). Photomontages of the Linfairn wind farm: click here. Dersalloch (about 3km from village, over the back of the Monument Hill, 23 turbines: 16 turbines at 125m and 7 at 115m to tip). Consented on 23 July 2014. Glenmount (up towards Loch Bradan – 26 turbines – reduced to 22 as of May 2013. Tip height up to 130m). 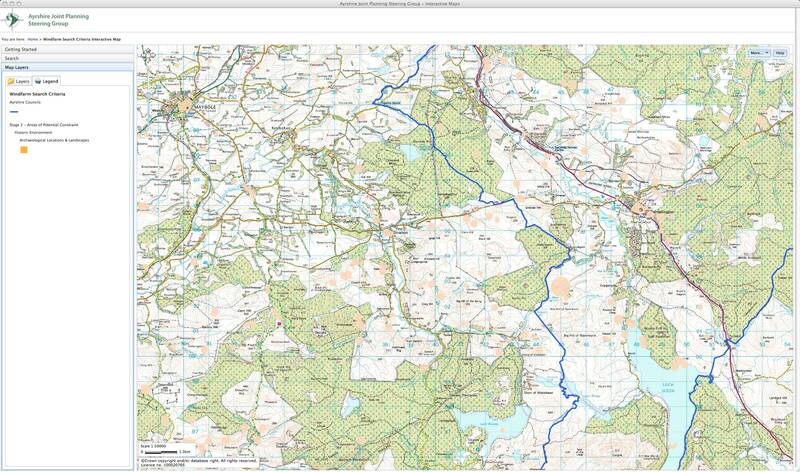 Hadyard Hill Extension (joining on to existing wind farm near Barr, would almost join up with Knockskae). This is somewhat out of date but will be replaced with an up-to-date version soon. 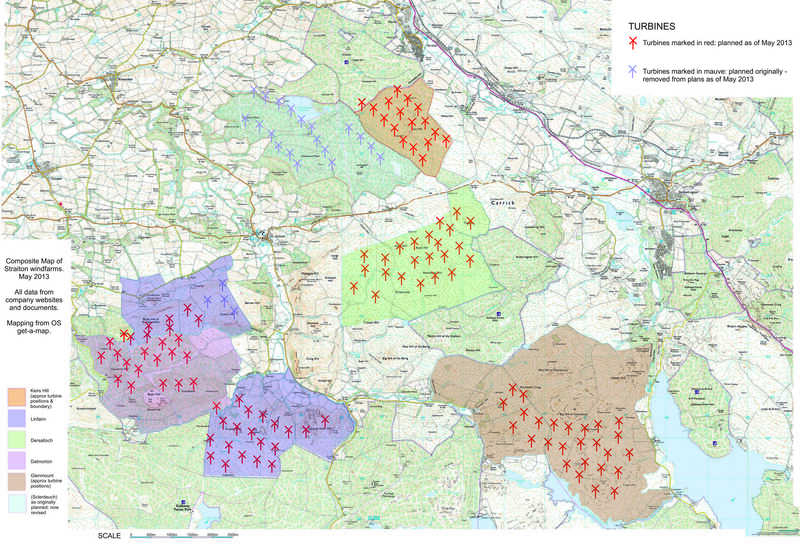 Click here for a Scottish Natural Heritage map of windfarm applications in Scotland as of August 2012 (this is a very large PDF, so will download slowly. It does not show Glenmount). Photomontages of the Linfairn windfarm: visit Gallery page, or click here. Key Documents List: these documents are in no particular order – apologies for their higgeldy-piggeldy presentation. All are relevant. If you would like to know where to start, our planning lead, Whirly Marshall, advises that the two most important documents are nos. IVa and IX on the list: Whirly has also provided PDF documents which summarise the key points in those documents. Aso known as Addendum to the Ayrshire Joint Structure Plan Technical Report TR03/2006 – Guidance on the Location of Windfarms within Ayrshire. This is a crucial document in assessing the suitability of windfarms in Ayrshire. We have not had time yet to prepare a summary of the key points. If anyone would like to comment, please do so. However, see the Linfairn page of this site, and comments on suitable land use, which are taken from this document. • Product development for walking and cycling, to package products more effectively for particular customer profiles. • Infrastructure enhancements, such as joining up paths and cycleways, working with communities and businesses to provide improved facilities. • Promote the development of related hospitality facilities through VisitScotland’s various ‘Welcome’ schemes. • Encourage and facilitate collaboration among providers to overcome fragmentation and offer stronger, packaged experiences, tailored to distinctive market segments. We have not yet had time to summarise this: if anyone would care to comment please do so. OK, now listen carefully. There is a Local Development Plan and there is a Proposed Local Development plan. Document IV is the Proposed one. “The [Proposed] Local Development Plan (LDP) is the new strategic land use document that, when complete, will replace the South Ayrshire Local Plan [q.v. – Document IVa on this page] and the Ayrshire Joint Structure Plan [q.v. Document IX on this page] as part of the wider modernisation of planning. It will set out strategic spatial priorities and policies for South Ayrshire and will secure land zoning for specified uses (e.g. land for housing/industry etc.) to provide increased certainty for development. In other words, as if things weren’t complicated enough, we have to take account of all the documents, current and proposed. The following is also from the South Ayrshire Proposed Local Development Plan. South Ayrshire has above-average wind speeds and is an attractive area for generating wind energy and, in particular, as a location for wind farms. The Scottish Government has set a target for 100% of Scotland’s electricity to be generated from renewable sources by 2020, and onshore wind power is one of the main sources of renewable energy. Given the Government’s target, we have a responsibility to fi nd wind farm locations that would contribute to the overall national supply, while taking any effects on the environment into account. Local benefits arising from wind farms can be important to the economic future of rural communities. e. they do not affect aviation, defence interest and broadcasting installations. This document is still in force, and it is important to know what it says. We have prepared some edited highlights: The following notes identify the key Policies of the Local Plan which are deemed to be relevant and some or all should be referred to in letters of objection. Further advice as to the drafting of these letters will be provided as the planning applications are publicised. Download the PDF file of our notes here: Key Local Planning Points. When you have mastered this you have to look at Document IV and Document IX as well! Not so much a key document as an interesting one. This presentation is downloaded from the Galloway and Southern Ayrshire Biosphere website. I think the opening photograph is of Loch Doon, with the Big Hill of Glenmount (site of a proposed windfarm). Am I right? Can anyone comment to confirm or deny? A report presented to the interested Local Councils including South Ayrshire. We have not had time to read or summarise as yet. Please comment if you can. 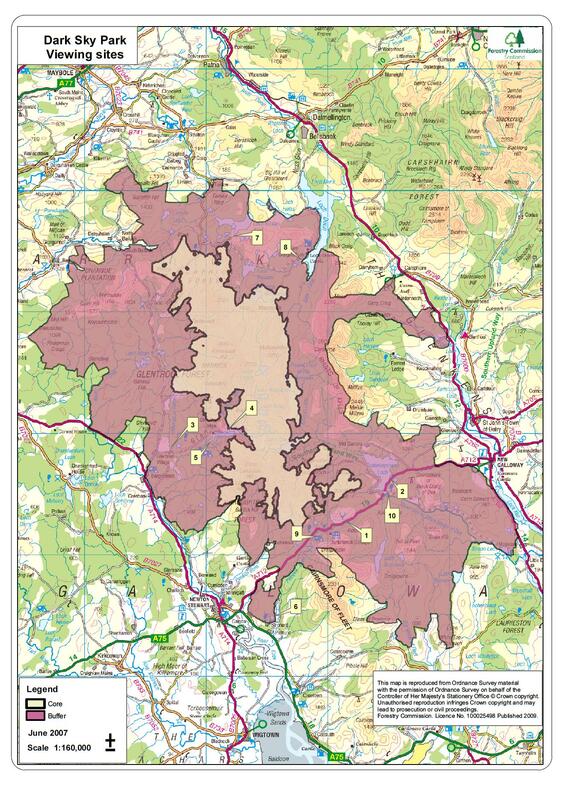 Vital document used for assessing land use and suitability for wind farms. Much complex information. One point of interest: the Stinchar valley is listed in this document as of National significance and high value. The proposed Linfairn site would be clearly visible from the tracks which border the upper Stinchar valley. Perhaps also from the lower valley towards Barr. Any comments? We have summarised some key points which are relevant to windfarms, and which should be referred to in objectors’ letters. Advice on drafting letters will be given when a Planning Application is anticipated. Download the edited highlights of the Joint Structure Plan as a PDF file here: Key Joint Structure Points. Modifications to the Ayrshire joint structure plan. Comments welcome. People are often concerned that wind farms might be too close to houses. There are no statutory limits in the UK. This document prepared for MPs at Westminster explains the planning guidance in different parts of the UK, with the different likely effects on the distance from housing. It should be noted that in Scotland there is a presumption (not binding but recommended) that windfarms should not be developed within 2Km of settlements (including villages). It should also very important to note that not only Straiton itself but the clusters of houses up the Girvan valley as far as Tairlaw are considered by Ayrshire planning as part of a settlement, and so entitled to the protection of a 2Km buffer. 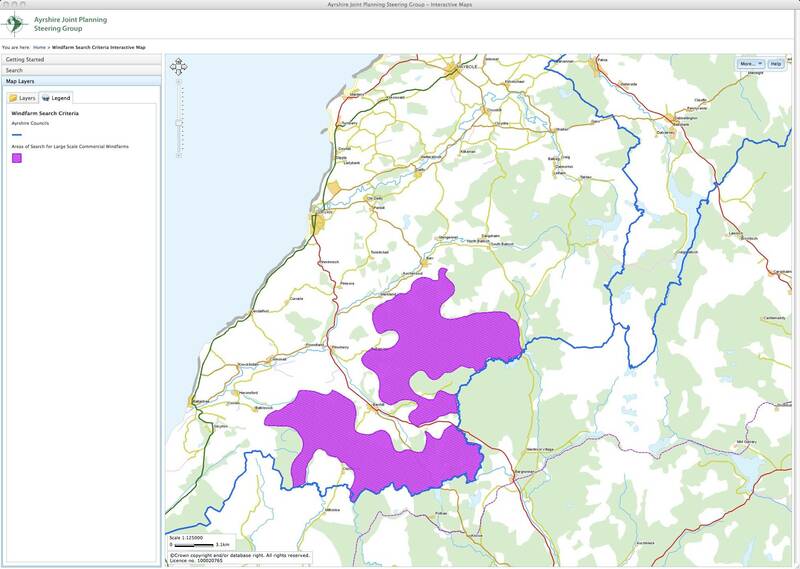 This is clearly shown on the interactive mapping service for windfarm development offered by the Ayrshire Joint Planning Steering Group: it shows that only six turbines (nos. 1-4, 10, 11) of the proposed Linfairn development should be permitted (i.e. lie outside the recommended 2Km buffer zone. Similar restrictions will apply to Sclenteuch/Keirs Hill and Glenmount, and I will post screenshots of those maps in due course. See map on the Linfairn page of this website. This report was commissioned by the Scottish Government from the tourism unit at Glasgow Caledonian University. It is a long, thorough and complex report. The Scottish Government has briefed the press that the report shows that Wind farms have no effect on Scottish tourism. This seems to me to be a mis-representation. Careful reading of the document shows that the situation is complex. But the authors point out that the developments that they consider had already been screened by existing planning laws so that a negative effect on tourism was prevented. In other words, permission had not been granted for wind farms in sensitive tourist areas, and those that were NOT in sensitive tourist areas did not have a detrimental effect on tourism. This may seem self-evident, but it is a very important point, emphasised several times within the document: and it essentially negates any broad claim that there is no effect on tourism. that designated areas should be protected. The evidence in this study is that most tourists are unaware of these attempts and assume wind farms are spread uniformly throughout Scotland. It may be argued that marketing should try to make a distinction between “undeveloped” wilderness areas with minimal landscape intrusion and “green” rural areas like Caithness and North East Scotland where, as in Denmark, wind farms are accepted as a positive attribute. I hope to be doing further work on this key document. Please let me have your views if you have time to read it all! The Galloway and Southern Ayrshire Biosphere has now been officially recognised by UNESCO. You will find details of it on the biosphere website and on UNESCO’s website. Below is a sketch map of the Biosphere from the Biosphere website. 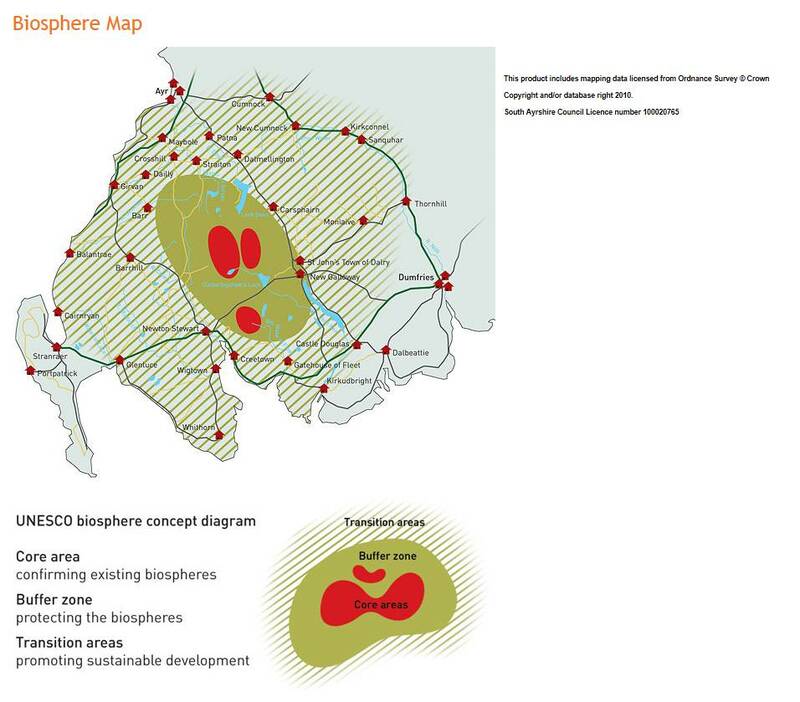 It shows that the upper Girvan valley down to just below Tairlaw (where it changes course) lies inside the “buffer” zone of the biosphere, which is conceived as “protecting the biospheres”. This buffer zone would have implications for two of the windfarms planned near Straiton: it would encompass the Glenmount windfarm site and would be touching the southern edge of the Linfairn windfarm site, at Genoch Inner Hill, which rises above Tairlaw. The Galloway Forest Dark Sky park is recognised nationally and locally as a tourist asset (for example by South Ayrshire’s tourism strategy document: see above). 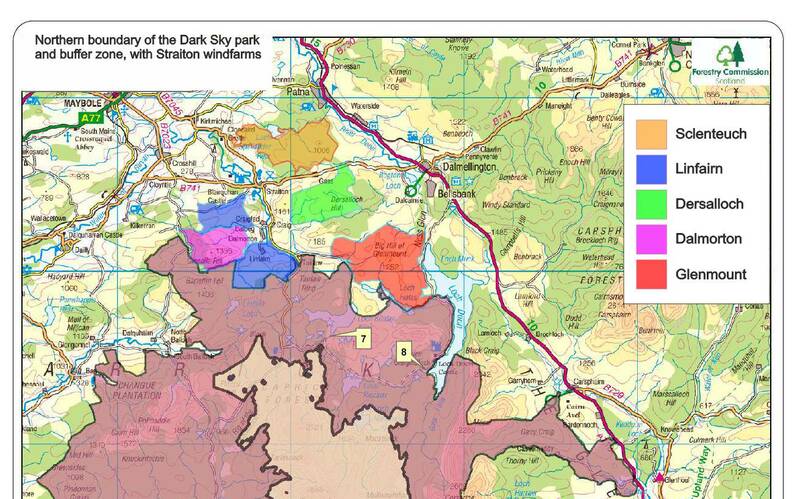 The map below shows the extent of both the Dark Sky Park and its (vital) buffer zone. The boundary of the buffer zone is contiguous with the southern edge of the Linfairn windfarm, and the Glenmount windfarm. Turbines at both windfarms would be likely to require lighting at night to avoid danger to aircraft. Both these proposed windfarms lie closer to the Dark Sky park than the Dersalloch windfarm, which, we understand is giving the Scottish government cause for concern because of its impact on the Dark Sky Park. A useful site for finding out about the many archaeological sites around Straiton and district is the West of Scotland Archaeological Service, which has a searchable database. A search for “Straiton” lists 256 separate sites. You could also try the database at Scotland’s Places which is sponsored by a number of major Scottish institutions. See the jpg below for an image of archaeological sites in the area, as mapped by the Ayrshire Joint Planning Steering Group. Archaeological sites are the faint orangey-pink blobs. There is a large number in the area of the proposed Linfairn windfarm: click here to see the detailed archaeological site information on the Linfairn page. Windfarm technology has already been discredited. With their low efficiency they could not provide energy in a High Demand period if there was not wind. Clearly the programme is just a massive gravy train for Investment Bankers, Land Owners, Local Authorities, and Scottish Government. As some of the developers have been set up purely to exploit the cash option, I suspect they will disappear at an early future date. Has Government required the developers to lodge a Performance Bond to guard against this eventuallity?